Discover a unique blend of rustic charm and sleek sophistication at the historic Glen Tavern Inn in Ventura County, California. Whether you seek a romantic or family getaway, or just peace and quiet, we invite you to make us your destination. Enjoy fine Italian and continental cuisine off the lobby at Enzo’s Italian Restaurant, the premier location for fine dining in Santa Paula, CA. The Glen Tavern Inn was built in 1911 and is known for its colorful history. At the time it was built Santa Paula was growing and prospering as an oil town, and was headquarters for Union Oil. The Tudor-Craftsman style hotel was designed by famed architects, Burns and Hunt, and was funded by a consortium of wealthy townsmen each of whom wanted one thousand dollars for its construction. The three story Inn was erected directly across from the train depot to provide accommodations to the many newcomers and businessmen lured to the area by the burgeoning oil and citrus industries. It also furnished a central gathering place for Santa Paula’s growing high-society circles. During Prohibition the Inn retained some of its Wild West origins as the third floor – at that time an open space not yet built out into separate guestrooms – harbored a speakeasy, brothel and gambling parlor. Many hotel legends stem from this era, including tales of murdered prostitutes and shootouts between unruly gamblers. These stories, though hard to confirm, persist with a life of their own as part of the hotel’s rich lore. Also in the 1930s, Hollywood discovered the valley hamlet of Santa Paula. Its rugged vistas and hills – improbably close to the sprawl of Los Angeles – made an irresistible setting for Western films. The Glen Tavern, being the place to stay, hosted such notables as Carol Lombard, John Wayne, Houdini and canine thespian Rin Tin Tin, who boasted his own suite long before “pet-friendly” entered the hospitality lexicon. Eventually, as oil money and old Hollywood moved on, Santa Paula traded fortune, vice and glamour for the quieter constancy of agriculture and small town Americana. The train depot became defunct, and likewise economic development bypassed the town. For the next half century the hotel endured a marginal existence, alternating owners and uses as it sank into flophouse decrepitude until in 2004 it was rescued by the current owners who acquired it with the aim of restoring its original grandeur. By 2007 the hotel was renovated top-to-bottom and reopened as a full service hotel, restaurant and lounge. It is frequently rented for private parties and events, and has reclaimed its once-faded status as a center for local social life. Guests and others can also enjoy fine dining at Enzo’s Italian Restaurant located within. In 2008 the Tavern owners were awarded Certificates of Special Recognition from the United States Senate, the United States Congress and the California State Assembly for their distinguished restoration of this irreplaceable landmark. 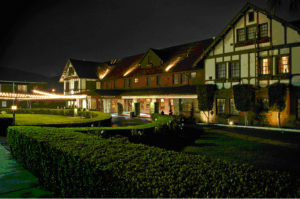 The renovation took pains to preserve the Inn’s unique historical attributes alongside the addition of more modern amenities. Also revived was the Inn’s fabled glamour, as visitors can now relive the gilded days of excess and adventure in a place where spirited revelers and restless spirits seem to commingle quite amicably. The Glen Tavern has recently been featured on MTV’s Teen Cribs, Ghost Adventures, The Dead Files, NCIS and the CNN Headline News travel series Southern California’s Best Kept Secrets. Alas, the secret is out. We hope you enjoyed your visit. Thank you for coming, please return, and tell your friends.